The best word I can come up with to describe Michael Chabon’s latest novel is ‘Epic’. An auto-biography wrapped in a novel disguised as a Memoir that in any hands other than Chabon’s would seem clunky and erratic. Luckily for us, the master of Tangents is at the wheel and if you’re game, all you have to do is strap yourself in and go along for the ride. The novel begins with the Author himself sitting vigil at his Grandfather’s bedside as he nears the final days of his life. They have always been close but now, memory stirred by the imminence of death, Chabon’s Grandfather begins to share stories that have never surfaced before. From this point, the Novel follows the life and experiences of Chabon’s Grandfather, blending fiction with non-fiction but which parts are which? We can only guess. Some people say Chabon is just being a smarty-pants with this ‘Novel’, trying to accomplish too many things at once. If you prefer that your fiction follows a straight forward linear narrative then I probably wouldn’t recommend this but if, like me, you’re quite partial to a few clever tangents put together with lots of wit and warmth then give Moonglow a go. If anything, it will be an unforgettable reading experience – one you’re unlikely to encounter again. 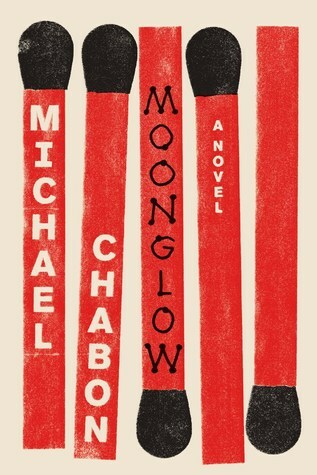 P.S If you loved Chabon’s earlier Pulitzer Prize winning novel ‘The Amazing Adventures of Kavalier & Clay’ and you are yet to immerse yourself in the world of ‘Moonglow’, get your skates on and grab a copy. You won’t regret it.